“Now God Himself and our Father, and our Lord Jesus Christ, direct our way unto you. And the Lord make you to increase and abound in love one toward another, and toward all men, even as we do toward you: To the end He may stablish your hearts unblameable in holiness before God, even our Father, at the coming of our Lord Jesus Christ with all His saints.”—1 Thess. iii. 11-13. There is no argument for or justification of prayer; nor even an explanation. It is assumed to be the natural and inevitable expression of spiritual life. 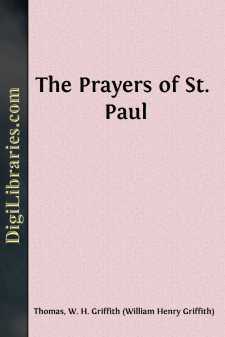 Most of the Apostle’s prayers of which we have a record are concerned with other people rather than with himself, and they thus reveal to us indirectly but very really what St. Paul felt to be the predominant needs of the spiritual life. In this series of studies we propose to look at some of these prayers, and to consider their direct bearing upon our own lives. Taking the Epistles in what is generally regarded to be their chronological order, we naturally commence with the prayer found in 1 Thess. iii. 11-13. In this passage we have what is not often found, a prayer for himself associated with prayer for others. 1. His Prayer for Himself (ver. 11). Let us notice Who it is to Whom he prays—“God Himself and our Father, and our Lord Jesus Christ.” The association of Christ with God as One to Whom prayer is addressed is of course very familiar to us, but it ought never to be forgotten that when the Apostle penned these words the association was both striking and significant. For consider: these words were written within twenty-five years of our Lord’s earthly life and ascension, and yet here is this quiet but clear association of Him with the Father, thus testifying in a very remarkable and convincing way to His Godhead as the Hearer of prayer. And this fact is still more noticeable in the original, for St. Paul in this verse breaks one of the familiar rules of grammar, whether of Greek or English. It is well known that whenever there are two nouns to a verb the verb must be in the plural; and yet here the Greek word “direct” is in the singular, notwithstanding the fact that there are two subjects, the Father and Christ. The same feature is to be found in 2 Thess. ii. 17. It is evident from this what St. Paul thought of our Lord Jesus Christ, and it is in such simple, indirect testimonies that we find the strongest and most convincing proofs that the early Church believed in the Deity of our Lord.